The unique nature, the mild climate and the wide variety of experiences available make Nova Scotia an area where a good quality of life is a high priority. As one of the three lake provinces in Canada, the peninsula of the same name lies directly on the Atlantic coast, and closely combines the flair of the ocean with a landscape where forest and lake enter into an extraordinary liason – and not only in the famous Indian Summer. Nova Scotia offers both visitors and residents a broad range of attractions and leisure activities, where you can enjoy sport, nature and recharge your batteries in equal measure. The region is known as “Canada’s Ocean Playground” for good reason, with the country’s most beautiful coast road, the Cabot Trail, idyllic fishing villages and the fascinating flora and fauna. Experience the unique flair of the Canadian region of Nova Scotia! If you dream of owning a property in Canada, Nova Scotia could bring your dreams closer. Even compared to other regions of the nature-rich country of Canada, population density in Nova Scotia is very low. On the other hand, the high quality of life and the smart surroundings are very attractive, to help make your dream of a life close to nature a reality, near the ocean, forests and lakes – either temporarily as a holiday location in your own holiday home, or permanently as a new home in Canada, if you meet the country’s requirements for immigrants. Properties in Nova Scotia are generous in size, and relatively inexpensive, as the region is still the best kept secret for tourists and others wishing to move there from overseas. Whether you would like to live in the property yourself, or you want your very own holiday home here: A property in Nova Scotia has that very special appeal that makes your dream of living in Canada a reality. 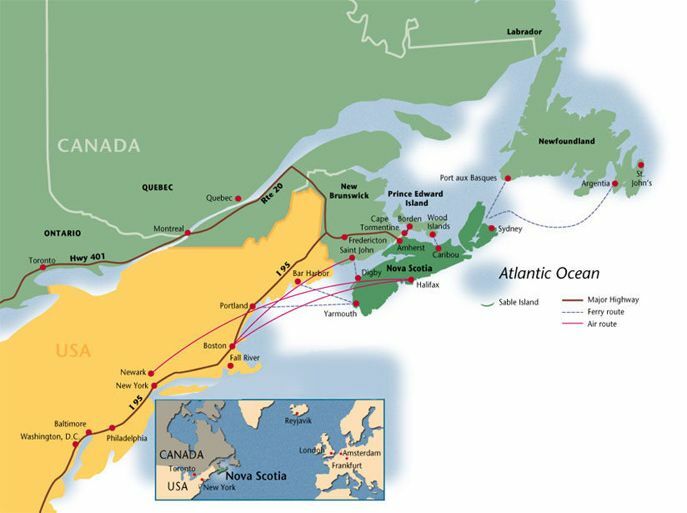 The current population of Nova Scotia is made up of 80% with ancestors from the British Isles, and 18% have their roots in France. The descendants of German and Dutch immigrants, and also members of the indigenous peoples, also call the province of New Scotland home. A wide selection of plots gives you the opportunity to do the same as the local residents and opt for an individual property in Nova Scotia.